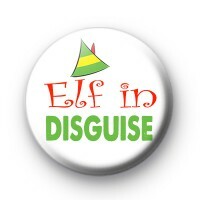 Elf in Disguise Christmas Button Badge. This 1-inch fun festive badge is for all Santa's Little Helpers, those that are elves in disguise. Perfect for kids Xmas Parties and Christmas Eve Boxes. It is a white badge with the text Elf In Disguise written in a fun font & a cute elf hat at the top. So add a little festive cheer with our Xmas festive fun badges. All handmade in our UK workshop. We have a huge range of Christmas badges so be sure to check out the rest in our Christmas badge category.